How fun it is blowing bubbles or a whistle! This is a very fun activity for young toddlers. But for kids with hypotonia (decrease muscle tone) it is something that they cannot take for granted. 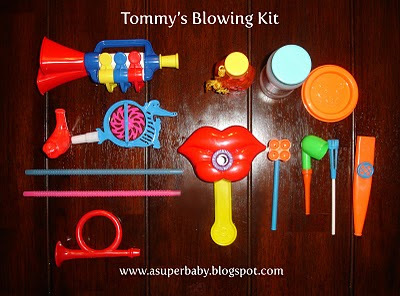 When Tommy was 12 months old we introduced single straws and Tommy discovered how to blow through the straw. 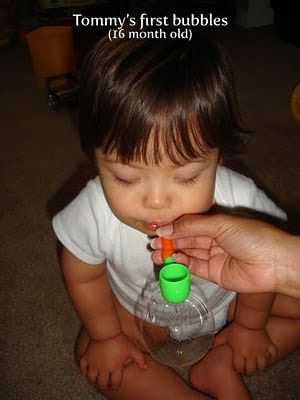 I followed Tommy's lead and blowing bubbles through the straws became part of our fun oral motor therapy. 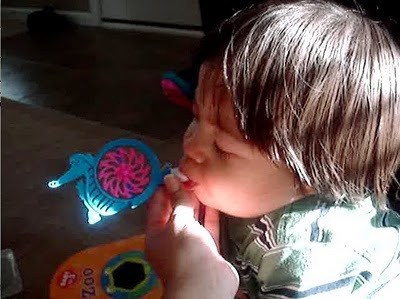 This was also the beginning of Tommy enjoying blowing hundreds of bubbles and the melodic sounds of a whistle as any other toddler. We have used different straws, bubbles blowers and whistles that I have chosen according to the difficulty of blowing each one. The best places to find them are the dollar stores and the party supply stores. You can also search online to find new innovative straws, bubble makers and whistles. We don't allow Tommy to hold them becasue the ones I have gotten are manufactured for older kids, which means they have small parts that can cause choking hazard. But for his birthday, we got a nice set of bubble blowers that he will be allowed to deep and blow. I am looking for a flute or a trumpet as other gift for his birthday. How proud we are of him! He is doing all kind of things. The fact he is not walking yet doesn't stop him to learn and doesn't discourage us to keep boosting his brain. Therefore, the next step in our art of blowing is from deep and blow to blowing bigger bubbles. After all, it is a fun activity. NOTE: Always chose bubbles blowers and whistles with round shape for the mouth area. Other shapes may promote tongue protrusion. Because Tommy is an artist, I recommend using a straw to blow blobs of paint on paper. Do you know what I mean? I think he would love the cause and effect!